You approach a stoplight as it’s about to turn red. Being a responsible driver, you slowly apply the breaks and come to a complete stop. Suddenly you hear the screeching of tires behind you. You hear the sound of crunching metal as you feel the shock of your vehicle being struck from behind. You stumble from your vehicle, slightly shaken, trying to rub the pain from back of your neck. 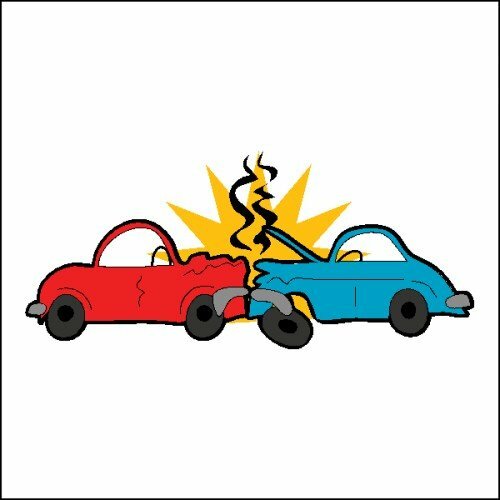 As you survey the damage, you see the driver of the other vehicle stomping toward you from the corner of your eye. “Are you okay?” you ask as you turn to face him. “Rah arg bah,” he bellows into your face. A blast of hot putrid breath startles you and sends you reeling. You try to steady yourself as you wipe the spit from you face. A sinking feeling comes over you with the realization that you’ve just been rear-ended by a Klingon. “Do you have insurance?” you ask apprehensively, aware of the fact that Klingons are notoriously irresponsible drivers. “Mok tuk bah,” he says as he jabs his crooked Klingon finger in the direction of the stoplight. “Listen mister, that light was clearly about to turn red.” You call him mister hoping that he’s male; it’s so hard to tell with their weird wrinkled faces. “MOK TUK BAH,” he screams at you with even more force. “So that’s how it’s going to be,” you calmly reply, again wiping the spit from your face. This time his spit seems to contain chunks of something that was recently alive. You vomit in your mouth a little. A lengthy argument ensues. Tensions flare. In the heat of the moment you say something unfortunate about the virtue of his Klingon mother being defiled by Captain Kirk. You soon discover–at ridiculous odds– this is the one phrase that translates directly from English to Klingon. You find yourself staring at the end of a menacing Klingon weapon of war. You swiftly make an attempt to apologize. You now discover the phrase “I’m sorry” in Klingon roughly translates to: stab me repeatedly and viciously. As you lie on the pavement bleeding to death, you wonder if a better grasp of the Klingon language could have helped you avoid this grisly end. So, how many times has this happened to you? Allow me to answer for you: it hasn’t and it never will. 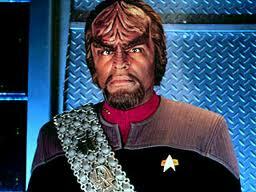 Klingons are a fictitious race from a fictitious planet invented in the mind of Gene Roddenberry. However, there is a Klingon language; a language that people endeavor to learn and speak. Why would a person endeavor to learn and speak a language spoken by a nonexistent race? I decided to ask a person who makes a habit of publicly speaking Klingon. Next Post: My Conversation With Klingon Speaking Ed. Starfleet officer and notoriously irresponsible driver. For the same reason people learned Tolkien’s Elvish … because they can. I learned to speak Elvis, because I ain’t nothing but a hound dog. Just be careful of Klingons when your on the highway.